Civil Asset Forfeiture Impound in 1984 Viceport. The Civil Asset Forfeiture Impound exists in 1984 in Grand Theft Auto: Vice City Stories, and is located just east of the Pay 'n' Spray in Viceport. 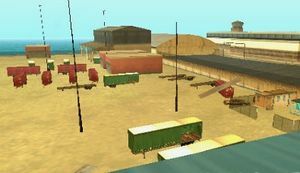 After completing the mission The Audition, the player may deliver several desired vehicles (listed below) to this location for a cash reward. Once at least two vehicles have been delivered, a second Civil Asset Forfeiture Impound becomes available: The Civil Asset Forfeiture Impound for Watercraft. In 1986, the entire impound lot no longer exists and is converted into an empty lot and a bomb shop. Oceanic ($500) - In front of Ocean View Hotel in Ocean Drive, Ocean Beach. Polaris V8 ($700) - North of The Clymenus Suite at the roadside (the road which is a blind alley), Vice Point. It can be also found in front of all prostitute businesses. Sanchez ($200) - Trailer-Park, Little Havana or Light House, Ocean Beach. The bike in front of the Light House will activate a mission. Therefore the player should cancel the mission first. Also the Sanchez is parked across Midland hotel. Stallion ($600) - At the Ocean Drive north of the future Ocean View Hotel, Ocean Beach. Also parked in front of all Drug businesses. Banshee ($600) - Mansion to the west of Ricardo Diaz's, Starfish Island. Also found in northernmost road in the map. Cheetah ($700) - Ricardo Diaz's mansion, Starfish Island. Also can be found in front of Lance's hotel, and behind Schumann medical care center, and along the northern road in Starfish Island. Comet ($500) - To the east of the main terminal in the parking lot, Escobar Int. Airport. Also located under an apartment building near Forbes's apartment. Freeway ($400) - Future drug factory of the Haitians, Little Haiti. Also can be obtained in front of a building in southern downtown along the road. Deluxo ($700) - InterGlobal Films (Reni Wassulmaier's contact point), Prawn Island. Also in front of Gonzalez's apartment and along Ocean Drive. Infernus ($900) - West of the Police hideout (Bryan Forbes's contact point) in the parking lot of the huge building where in Vice City the Rockstar Games logo was, Downtown. Also parked in Lance's house in Ocean Beach. Also parked in one of the mansions in northern Starfish Island. Maverick ($900) - Airport area, Escobar Int. Airport. Also located on the helipad north of Hyman's memorial Stadium. PCJ-600 ($500) - Parked next to the enforcer in downtown police station and under the bridge linking Vice point and Prawn Island. These two will activate a mission, so the player should cancel them beforehand. Another one is located near the Vice point mall. The last PCJ-600 can be found behind Forbes's apartment. Sabre ($600) - Behind the Church, Downtown. There is a second vehicle in Little Haiti. Stinger ($600) - In front and back of Fire Station, Downtown. There is a third one behind Malibu Club. This page was last modified on 25 December 2012, at 22:41.